For people that are around Munch this weekend (until Sunday, the 1st of May), this is the chance to appreciate an impressive bond between art and renewable energy. 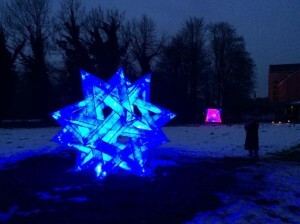 One of the hottest spots of the Munich Creative Business Week (MCBW) is the Kraemer’schen Kunstmühle (Birkenleiten, 41) featuring “Der blaue Stern” (The Blue Star) by the artist Sigi Bußinger. During the day, visitors at the Kraemer‘schen Kunstmühle encounter, in the field behind the traditional location, transparent stars powered by their own hydro power plant. At night these colorful stars from Sigi Bußinger illuminate the location as if they had fallen from the sky. Where does the energy that supplies Sigi Bußinger’s stars come from? In the Auer Mühlbach an installed 5 kW SMART Duofloat turbine is combined with photovoltaic panels designed and built by AquaSoli. Both sources are connected to a SMART Electrical Management System that powers Sigi Bußingers’s stars. Over the past three years Munich Creative Business Week (MCBW), the largest design event in Germany, has evolved into one of the main attractions in the design world.